The Tool Calibration and Control System is an overarching system within your Quality Assurance Management Systems. It is required for ISO 9001 registration. 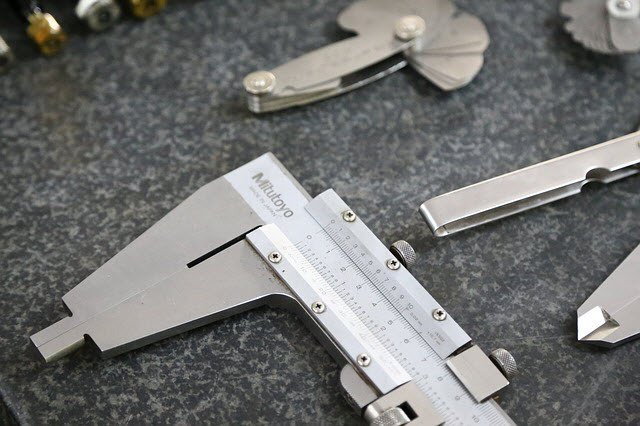 Ensuring your measurement instruments are measuring correctly is important to maintaining your process and product quality. Calibration is the process of comparing an instrument's accuracy to known standards. The instrument accuracy is usually documented in the equipment’s manual. When calibrating the equipment, compare across the entire measurement range of the equipment. Select accuracy data points from the low, mid and high range of the equipment. The known standard must have a tighter accuracy then the instrument. For calibration of dimensional tools, the known standard should have a 10 to 1 accuracy of the instrument. Primary Standards: Those units or instruments of highest quality and stability which are periodically calibrated by the National Institute of Standards and Technology (NIST) or by other contract calibration services which have direct traceability to NIST. Primary standards are used in a controlled environment of 23°C ±2°C and relative humidity of 40% ±10% (when applicable). Transfer Standards: Those units or instruments with proven stability are calibrated from primary standards in a controlled environment. Transfer standards are stored in a controlled environment of 23°C ± 2°C and relative humidity of 40% ±10% (when applicable). Working Standards: Those units or instruments with proven stability that are calibrated from transfer standards. You use working standards to measure product and process quality. Transfer standards are used to calibrate the working standards. These are traceable to NIST. Primary standards are usually kept at NIST or calibration labs and maintain NIST certification. All standards must be traceable to NIST. We recommend reviewing all process equipment that have continuous analog or digital output. If there are no other calibrated instruments that can be used to monitor that output, then that process equipment also needs to be calibrated. For example, an oven has a digital readout. Lets say the oven needs to be set at 125 C. During oven operation the digital readout is 125 C, but how can you be sure this is correct? If you have a calibrated thermometer then this can be used assure the oven is actually 125 C. If you do not have a calibrated thermometer then the oven’s digital readout needs to be calibrated. Determine the calibration records that shows the requirements and calibration results. Discuss the flow to assure that new instruments / process equipment are calibrated prior to use. Determine the identification of defective standards. Calibrate Prior to Use label. Used for equipment that must be checked for accuracy prior to use. Reference Only, Not Calibrated label. Used for analog and digital readouts that are monitored with other calibrated equipment. Do Not Use label. Place on equipment that is out of calibration and not repaired. Conducting an MSA study for continuous data.